On September 21, 2018 CPDA in collaboration with the Far West Agribusiness Association (FWAA) sent a letter to WSDA requesting that the agency temporarily delay the implementation of its proposed plan to establish synonym names for principal functioning agents used in spray adjuvant formulations. WSDA had recently shared with CPDA their intent to develop Principal Functioning Agent text for spray adjuvant ingredients that would be acceptable to both the agency and registrants, with the goal of updating information for all existing ingredients in their database by the end of 2018. CPDA and FWAA signaled that implementation of this initiative before industry has had an opportunity to thoroughly vet the plan and provide input to the Department would be premature. Both groups cited concerns related to Confidential Business Information (CBI) protections that could possibly be eroded under the Department’s proposed use of synonym names. In the joint industry letter sent to Kelle Davis of the WSDA Pesticide Management Division, CPDA and FWAA emphasized that the process would force the disclosure of CBI for products registered by WSDA. Both associations urged WSDA to continue the registration of new adjuvants in accordance with current practice, pending industry’s review of the naming proposal so as to avoid a potential backlog of products awaiting Department approval. CPDA has established a work group to review the WSDA list in order to develop recommendations that would ensure the continued protection of CBI. All CPDA members are invited to participate on this work group. For more information, please contact CPDA Director of Regulatory Affairs Sylvia Palmer (spalmer@cpda.com) or call (202) 386-7407. CPDA is the preeminent U.S.-based industry trade association supporting the interests of the agricultural adjuvants and inert ingredients industry, and manufacturers, formulators and distributors of post patent pesticides and other agrotechnology products through its robust legislative and regulatory affairs programs. The core of CPDA’s mission is built on the realization that issue priorities can differ significantly depending on whether your company is a producer, formulator/distributor, or an adjuvant/inert ingredient supplier. Each of these segments within the agrotechnology industry faces a unique set of challenges in retaining a competitive edge in the marketplace. This new structure will assist CPDA in more effectively serving as the industry voice and advocate for uniquely challenging issues specific to the agrotechnology industry – issues that other agricultural chemical trade associations simply do not address. Membership in the Council provides companies a “seat at the table” in advocating for policy changes that impact their operations and protect their interests. When an issue suddenly arises that affects a segment of our membership, CPDA responds by directing staff and member expertise to resolve the problem. For an individual company to attempt problem resolution, the costs could be prohibitive and the effort ultimately unsuccessful. As a trade organization, CPDA is well positioned to represent a large group of impacted companies and to speak as one voice for the agrotechnology industry on critical policy matters. Past experience has proven that the voice of the association has been heard and addressed by the EPA, OSHA and state agencies. CPDA has engaged extensively with OSHA on advocating for changes to the Hazard Communication Standard (HCS 2012) that would stipulate that sealed containers in warehouses would not have to be relabeled based on new hazard information if an updated label is transmitted electronically to downstream entities as is allowed for updated safety data sheets. CPDA has voiced its concerns to OSHA that distributor warehouses are not equipped to safely relabel sealed product containers and that this requirement would subject warehouse workers to unnecessary health and safety risks. CPDA continues to work in strong support of enactment of legislation that would provide a long-term reauthorization of PRIA. The PRIA category fees and review timelines important to our member are established under PRIA ensure that decisions on pesticide product and inert ingredient submissions are made by EPA on a timely basis. This provides companies the certainty they need in planning for the demands of the growing season. CPDA’s efforts played an important role in the inclusion of PRIA as part of the House and Senate Farm Bills. 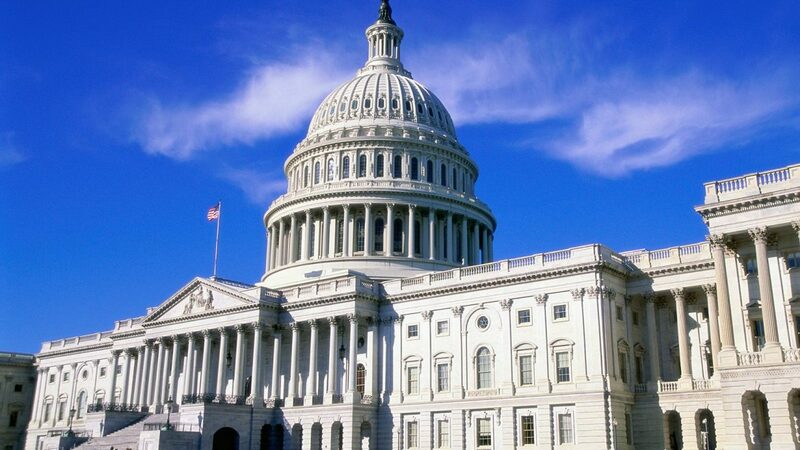 With current Farm Bill programs set to expire on September 30, 2018, the House and Senate majority leadership are hoping to complete work on a conferenced bill very shortly. CPDA is collaborating with its allied trade association partners on the PRIA Coalition to ensure the PRIA language remains in the final Farm Bill. CPDA has devoted considerable resources in seeking the elimination of the duplicative Clean Water Act permitting requirement for FIFRA registered pesticides applied in, over or near waters of the United States. The Council was successful in securing the inclusion of language, known as the National Pollutant Discharge Elimination System (NPDES) provision, in both the current versions of the House and Senate passed Farm Bills that would obviate the need for this redundant permit for the lawful application of pesticides. CPDA continues to meet with EPA staff on a variety of pesticide drift issues, and recently developed a set of recommendations on possible changes to the Agency’s Drift Reduction Technology (DRT) verification test protocol, a key component of the star rating aspect of the DRT Program. CPDA remains committed to working with EPA on pesticide drift and educating Agency staff on tank-mix adjuvants and the nature of pesticide formulations. CPDA is actively engaged on key state issues including the pending changes to product label warning requirements slated to go into effect at the end of August 2018 under California Proposition 65. 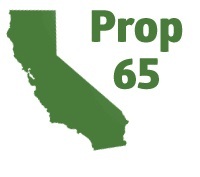 CPDA recently joined with several other industry trade associations in submitting comments to California’s Office of Environmental Health Hazard Assessment (OEHHA) voicing concerns that the proposed Proposition 65 safe harbor warning requirements conflict with EPA requirements for pesticide labeling under FIFRA. 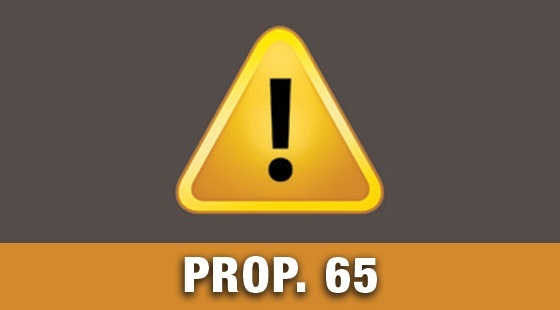 CPDA and the other groups objected that the Proposition 65 warning requirement on a FIFRA-registered product would contradict EPA approved precautionary language and use directions. Moreover, this requirement could serve as a precedent for other states to follow thereby leading to confusion not only within industry, but for consumers and state regulators as well. CPDA continues to work with its allied trade association partners to resolve the dilemma that would be created under the pending Proposition 65 product label warning requirements. CPDA continues to collaborate with Washington State Department of Agriculture (WSDA) regulators in expressing the serious concerns of its member companies with the department’s notice to adjuvant registrants regarding inert ingredient disclosure. CPDA has objected that the increased specificity would compromise the identity of many products that adjuvant producers sell. In June 2018, CPDA met with representatives of EPA’s Office of Pesticide Programs (OPP) to discuss reports received from member companies suggesting that the Agency is routinely failing to meet its PRIA timelines for the review of inert ingredient submissions despite EPA’s assertion to the contrary. CPDA remains fully engaged on this issue and continues to solicit member feedback on their experience with the registration process. The goal is presenting a set of final recommendations to the Agency aimed at facilitating the timely review of inert ingredient applications and reducing the number of renegotiations that are taking place with apparently increased frequency. These are just a few examples of what CPDA is doing on behalf of its members whose businesses are aligned with one or more of the three industry segments described here. Our goal is to focus on issues and policy germane to our members while collaborating with aligned associations to have a powerful, consistent message to the agencies. As we strive to effectively advance our industry’s mission and ensure critical regulatory and legislative policies are science based and equitable, we seek to recruit and retain a critical mass of companies looking to succeed in the U.S. agricultural chemical marketplace. To ensure your voice is heard during the development of new public policy and when current public policy threatens the economic success and viability of your company and the industry, we need your continuing support and the support of others as the resource base for the Council’s work. Participation and involvement of our members is the bedrock upon which we build our advocacy efforts – whether in the halls of Congress, with key federal and state agencies, or through collaborations with allied partners in the agrotechnology industry. 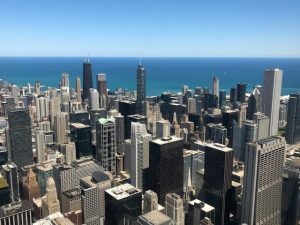 The beautiful skyline of downtown Chicago was the backdrop of the 2018 CPDA Summer Conference & Annual Meeting. 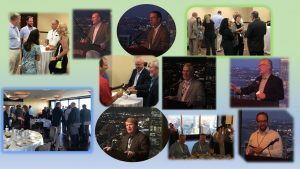 CPDA concluded its very successful 2018 Summer Conference & Annual Meeting held July 16-18 at the Omni Chicago Hotel in Chicago, Illinois. The highlight of this year’s program was a comprehensive discussion of the “new” CPDA and the value the organization provides to its members, specifically how Council membership enhances the representation of producers, formulators/distributors, and adjuvant/inert ingredient suppliers on state and federal legislative and regulatory issues specific to each of these market segments. The CPDA Summer Conference & Annual Meeting speakers program also addressed an array of other important topics including challenges encountered in the inert ingredient approval process under FIFRA, issues surrounding the registration of agricultural adjuvants in the state of Washington, the latest on pending changes to product label warning requirements under California Prop 65, the legislative outlook for the reauthorization of PRIA and the Farm Bill, a discussion of how advancements in adjuvants are helping to mitigate such problems as pesticide drift and weed resistance, as well as other issues of critical importance to the agrotechnology industry. 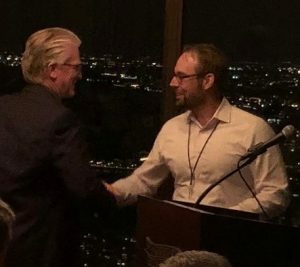 On the evening of Tuesday, July 17th, conference attendees gathered at Chicago’s famed Signature Room on the 95th in the John Hancock Building for the annual CPDA Awards Banquet. This is an event held every year during which CPDA recognizes individuals in honor of an achievement, contribution or service provided to the Council or industry. The Awards Banquet is a celebration of the important accomplishments of these individuals that have led to the many important milestones in the agrotechnology industry that exist today. Presiding over this year’s ceremonies was Gary Groves, Solvay. 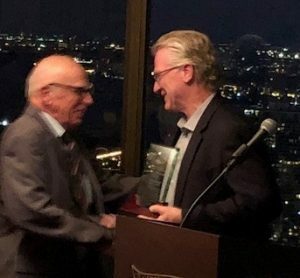 Jim Reiss, Precision Laboratories (right), congratulates Dr. Donald Penner, recipient of the Warren E. Stickle Lifetime Achievement Award. Among this year’s award recipients was Dr. Donald Penner from Michigan State University who was given the CPDA “Warren E. Stickle Lifetime Achievement Award.” The award highlighted Dr. Penner’s distinguished academic career, personal development of future weed scientists, patents and revolutionary industry contributions on the effect of adjuvants on the mechanism, and properties, fate and transport of herbicide formulations in the control of weeds. Gary Groves, Solvay (right), presents the Service to the Council Award to Dr. Joe Gednalske, Winfield United. The “Service to the Council Award” was bestowed upon Dr. Joe Gednalske, Winfield United, LLC, for his many contributions over the years in support of CPDA’s representation of manufacturers of spray tank adjuvants. The “Outgoing Chairman Award” was presented to Dave Allen, Stepan Company, for his steadfast leadership, guidance and vision in transitioning the Council to a “new” and stronger CPDA. Steve Solarski, AkzoNobel Surface Chemistry, LLC, was recipient of the “Service to the Board Award” for his many years of dedicated service as a member of the CPDA Board of Directors. Please join us in congratulating this year’s CPDA awards honorees! Dave Allen (right), passes the Chairman’s gavel to Jim Reiss. 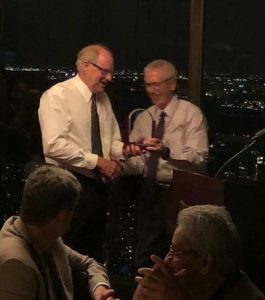 The conclusion of the 2018 CPDA Summer Conference & Annual Meeting Awards Banquet marked the passing of the gavel from Outgoing Chairman Dave Allen (Stepan Company) to Jim Reiss (Precision Laboratories, LLC). The CPDA staff looks forward to working with Jim in his new role as Chairman over the coming year as we continue to advance the work of Dave Allen and other members of the Board of Directors in building a new and even more robust CPDA. CPDA Thanks the Sponsors of the 2018 Summer Conference & Annual Meeting! Silver Level: Exacto Inc.; Rosen’s Inc.; and Stillmeadow, Inc. The speaker presentations from the 2018 CPDA Summer Conference & Annual Meeting may be accessed by clicking the links below. 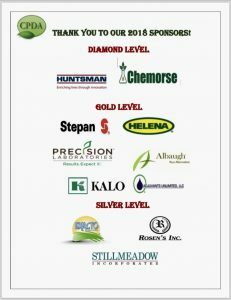 “Value of CPDA Membership – Producers,” Tim Stoehr, Albaugh Inc.
CPDA thanks all those who attended! The groups also raised concerns that the competing Proposition 65-specific warning requirements could serve as a precedent for other states to follow thereby leading to confusion not only within industry, but for consumers and regulators as well. CPDA continues to work with its allied trade association partners and provide additional input to California regulators and EPA in seeking to resolve the dilemma that would be created under the pending Proposition 65 product label warning requirements. To access a copy of the joint industry comments, please click here. On June 28, 2018, the U.S. Senate passed its version of the Farm Bill, titled the “Agriculture Improvement Act of 2018,” by a vote of 86-11. The Senate vote was held one week after the House passed its version of the legislation, the “Agricultural Nutrition Act of 2018,” on June 21st by a narrow vote of 213-211. The House and Senate passed Farm Bills contain provisions that would reauthorize the Pesticide Registration Improvement Act (PRIA) and would eliminate the National Pollutant Discharge Elimination (NPDES) permitting requirement for FIFRA registered pesticides. As reported previously, CPDA has engaged in extensive lobbying efforts in building a broad base of support in both the House and Senate for inclusion of these provisions in the Farm Bill. In addition to the language on PRIA and NPDES, both measures contain provisions that recognize biostimulant technology and research. A joint conference committee will now be convened to work out the differences in both the House and Senate passed bills. While it is likely that there will not be any significant opposition to retaining the PRIA and NPDES language in the final Farm Bill, there are larger national issues that could slow progress of the bill in conference – particularly the food stamp work requirements that were adopted as part of the House legislation. CPDA will work with its allied trade association partners on the PRIA Coalition to make sure that these provisions remain in the final Farm Bill while debate over more controversial issues continues. With current Farm Bill programs set to expire on September 30, 2018, the House and Senate majority leadership are hoping to complete work on a conferenced bill by the upcoming Labor Day weekend. CPDA will keep its membership apprised of further developments as they occur. On May 30, 2018, the Attorneys General from the states of California, Maryland and New York filed a lawsuit against EPA over the Agency’s delay in publishing a notice of availability of revised training materials that focus on the expanded pesticide safety and application requirements under the Agency’s changes to its 2015 Worker Protection Standard (WPS). The suit, filed in the U.S. District Court for the Southern District of New York, asserts that EPA’s delay in the publication of a notice of availability of these materials effectively denies farmworkers and pesticide handlers training that can enhance health and safety protections in the application of pesticides. In November 2015, EPA promulgated a final rule making changes to the WPS among which was a requirement that employers provide training to farmworkers and pesticide handlers covering a list of health and safety topics that were expanded under the revised regulation. The 2015 rule required employers to comply with the new pesticide safety training provisions within 180 days after EPA published in the Federal Register a notice of availability of the updated training materials. In their lawsuit, the Attorneys General maintain that by not committing to a deadline for completing the rulemaking process, the Agency has essentially delayed indefinitely the compliance dates of the enhanced pesticide training requirements promulgated in 2015. They called the delay “arbitrary and capricious” and argued that it denied farmworkers and pesticide handlers the improved training that would protect their health and safety. The Attorneys General requested that EPA immediately be made to publish a Federal Register notice announcing the availability of the training materials already developed. A copy of the complaint filed by the Attorneys General may be accessed by clicking here. EPA has announced an extension of the comment period and a public hearing on its proposed rule titled “Strengthening Transparency in Regulatory Science,” published in the Federal Register on April 30, 2018. The public comment period, originally scheduled to close on May 30, 2018, will now end on August 16, 2018. Comments may be submitted at www.regulations.gov identified by docket number EPA-HQ-OA-2018-0259. The public hearing will be held on July 17, 2018 at EPA’s William Jefferson Clinton East Building, Main Floor Room 1153, 1201 Constitution Avenue, N.W., Washington, D.C., from 8:00 a.m. to 8:00 p.m. (EST). Individuals wishing to present oral testimony must register by July 15th via email at staff_osa@epa.gov or online by clicking here. The draft rule would require EPA to conduct independent peer review on all ‘pivotal regulatory science’ used to justify regulatory decisions. In addition, the proposal would allow the EPA Administrator to grant exemptions to its data transparency requirements on a case-by-case basis. EPA cites a number of environmental statutes as providing the underlying authority for its proposed rulemaking including the Federal Insecticide, Fungicide and Rodenticide Act (FIFRA). The Agency is seeking comment on a number of far-reaching issues such as the potential effects of the proposed rule on individual EPA programs, how to balance appropriate protection of confidential business information with the proposed requirements for increased transparency of pivotal regulatory science, and whether the transparency requirements should apply to other types of regulatory actions such as guidance. EPA provides an expansive list of other issues for which it is inviting public comment on the draft rule. Since its publication, the draft rule has generated a significant level of controversy from critics who voice concerns that its proposed requirements would limit the available scientific information and studies upon which EPA bases its regulatory decisions. They also charge that EPA truncated the required Office of Management and Budget (OMB) review process in a rush to get the proposed rule published in the Federal Register. It is not clear to what extent the proposed rule, as written, would have on EPA pesticide registration and tolerance review activities. While EPA states that “nothing in the proposed rule compels the disclosure of any confidential or private information in a manner that violates applicable legal and ethical protections,” there is concern within the pesticide registrant community that CBI protections could be weakened or compromised under this initiative. A copy of the draft rule may be accessed by clicking here.